Like humans, pets require water as a vital element for survival. Water constitutes approximately 70% of a cat's or dog's body. Encouraging your pets to drink more water helps promote their health and well-being. 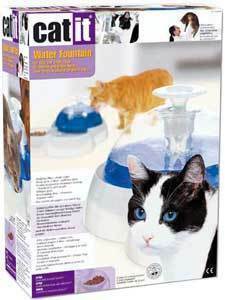 The Catit® Drinking Fountain responds to your pet's need for a continuous supply of water. Re-circulating water with greater exposure to oxygen provides fresh-tasting, cool, filtered water for pets with a multitude of health benefits. Encouraging cats to drink more water helps ensure proper kidney function and may decrease the incidence of crystal formation and urinary disease (FUS).